The fire ant (Solenopsis invicta) has long been acknowledged as a feisty adversary to humans and animals alike. Their stings are composed of incredibly potent venom, which acts as an insecticide, being up to three times more lethal to other ant species than the banned chemical DDT. This invasive species to the USA has held the top spot in its new environment by dominating its competitors. However, another invasive ant species has made its way into the fire ants adopted territory, and has had an until now secret defence against the fire ants venom. The tawny crazy ant (Nylanderia fulva) has recently invaded the south-eastern United States. In interactions between the two species, scientists from the University of Texas in Austin noticed that crazy ants were seemingly able to overcome the fire ants’ venom. The crazy ants were observed moving away from fire ants once they were attacked, and then would touch their mouth to their abdomen, proceeding to wipe their mouths over their bodies. 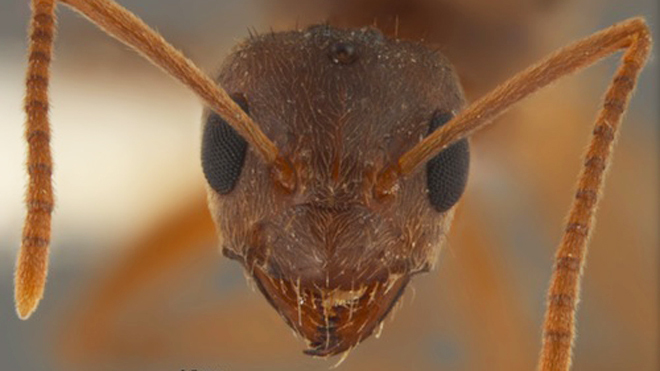 To find out why, scientists exposed crazy ants to fire ants in the lab. Of the crazy ants attacked by the fire ants, 98% were found to be able to detoxify themselves. In a similar test, where the crazy ants had the glands on their abdomens sealed, about half of the ants died. These results led to the conclusion that the formic acid produced by the crazy ant from glands in their abdomen somehow neutralises the effect of the fire ant venom. 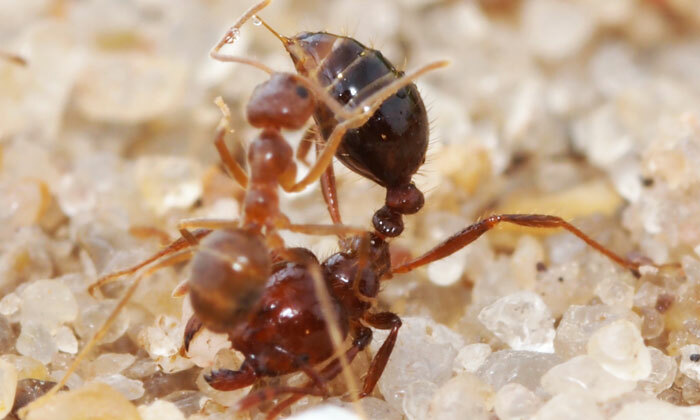 It is not yet known how this is achieved, but the study authors have suggested that the formic acid may prevent the toxin from penetrating the crazy ant’s exoskeleton. Interestingly, both of the ants in the study come from the same region of South America; southern Brazil and northern Argentina. The response of the crazy ants to the fire ant toxin is therefore likely to have evolved through an ‘evolutionary arms race’, where either species evolves new adaptations which allow them to better compete against the other. This presents a puzzle as to why the crazy ants in the southern US are so greatly outcompeting their rival species; neither appears to have the ‘edge’ and dominate in their joint native range. It has been suggested that in their native habitat, other ant species are involved in complex interactions which prevent either species from dominating. This has been compared to rock-paper-scissors, where one hand gesture dominates another, but is itself dominated by another. Fire ants dominate other ant species, these species dominate crazy ants, and in turn, crazy ants dominate fire ants. This type of interaction makes the system very stable, with a low likelihood of any species being pushed towards extinction by another. This adaptation has led to crazy ants outcompeting fire ants and many other arthropod species in the areas they are colonising. This results in smaller arthropod diversities and abundances in areas containing the crazy ants, which could have knock-down effects on ecological interactions, with less food available for birds, reptiles and other insectivorous animals. The crazy ant also appears to be a problem to humans, nesting in houses and often damaging electrical equipment. The potential effects of this invasive are therefore particularly wide ranging. Potential good news for humans and wildlife alike is that crazy ants are very slow colonisers, advancing by about 600 feet a year. They’re also likely to be limited by colder temperatures and unsuitable ecological conditions the further north they push. So perhaps their take-over won’t be so crazy after all. Next ArticleWhat’s brown but not as sticky as you might think?